Ever wanted to get textures out of Bryce? Of course you have! Well, there’s quite an easy way to do this so that you can use these textures in other programs. The textures won’t look exactly the same as they do in Bryce, but hey, experiment and see what happens. 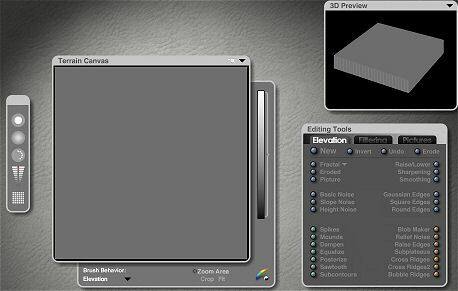 Create a terrain and click on the E button to enter the Terrain Editor, then click on New to get a blank terrain. Make sure you have the highest color selected (white). And paint the entire terrain until it is solid white. You can lower the terrain if you wish using the Raise/Lower option. Accept the changes and go back to the Bryce main window. 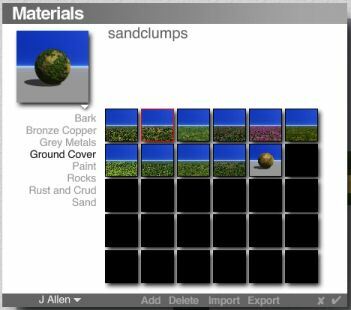 Bring up the Material Library and choose a texture. Here I’ve chosen sandclumps from a package by Jonathan Allen. Accept the texture by clicking on the check mark. 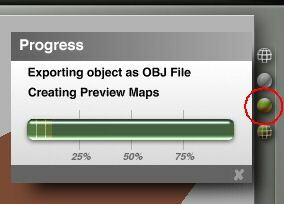 Now, choose File : Export Object from the file menu. 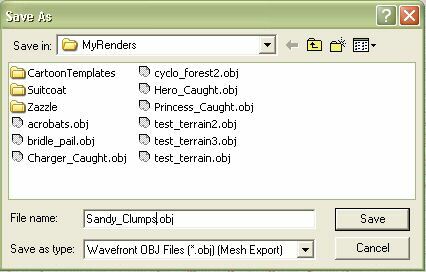 Enter a name for your object and select the Wavefront OBJ format. Click on the Material Preview ball (circled) and Bryce will create the preview maps. 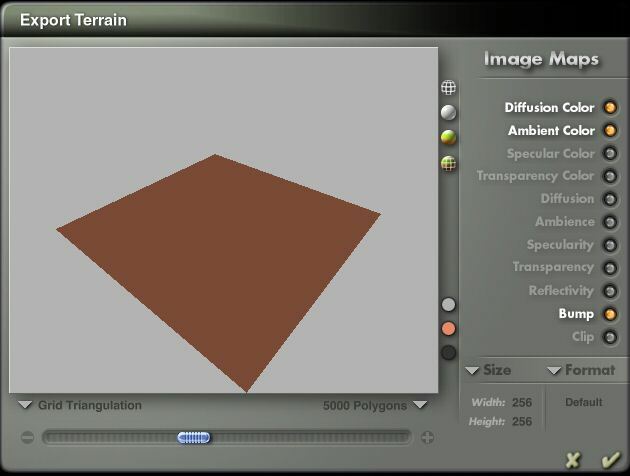 The right side of the Export Terrain panel contains the Image Maps area. Notice that Diffusion Color, Ambient Color, and Bump are selected. This is because these items had a blue ball in the columns. If you used the same texture as the diffusion and ambient colors, then deselect the Ambient Color option (or not). At the bottom are the Size and Format pull-down menus. The default size is 256×256 while the default format is .bmp. Bring up the Size menu and choose the size you want to export the texture at. I prefer 1024×1024 just so I can use the textures in a size where I don’t have to worry about it being seamless. Also, the larger the size, the more details in some cases. If you want the image exported in a different format than .bmp, then bring up the Format menu and choose your favorite format. 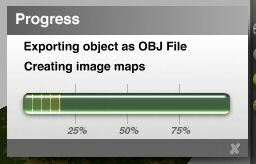 Once you are ready, click on the check mark and Bryce will begin exporting out the image maps and the terrain obj. 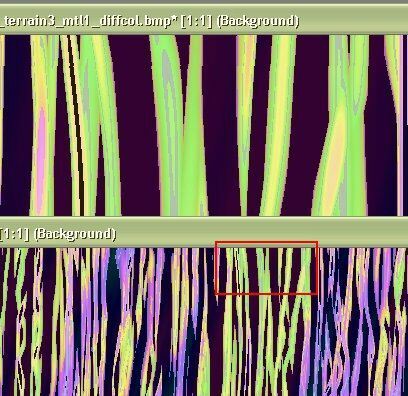 Here is the results of the image map export, the first texture is the ambient channel, the second is the bump map, and the third is the diffusion. 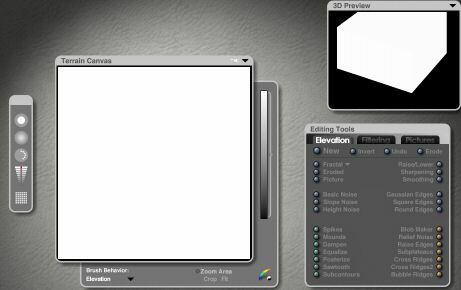 You can now import these textures into another program like trueSpace or ZBrush. Example of different export sizes. The image is back was exported at 1024×1024 while the one in front was exported at 512×512. The area in red on the front image is the same section shown in the back image. You can also change the scaling of the texture in the Material Editor in order to affect how much you get. The first image shows the default Stone Wall texture at its default scale of 18.7% and the second image shows the scale changed to 100%, both at 512×512. Remember, you won’t get the same amount of detail from the exported textures as you do in Bryce and they aren’t seamless, although they could be made seamless with a bit of work on your part. Play with the bump map settings in whatever program you import the textures into in order to increase the details. Also, remember to honor copyright issues. If the original material preset wasn’t created by you, then the exported textures can only be used for your own personal use.